First Line: Squished into a cable car, hurtling down a steep hill, clinging to a rail with the wind rushing in your ears amid the clang and clatter of metal and the shrieks of fellow passengers might not be everybody's idea of a romantic moment, but strangely, it was working for me. It wasn't easy but Jordan Bingham managed to score a romantic getaway to San Francisco with her main squeeze...as long as she picks up a primo copy of a Dashiell Hammett mystery for her curmudgeonly boss. Jordan's main man just so happens to be a Hammett fan, and besides visiting his estranged grandmother, he intends to see the Hammett highlights. But things start going downhill fast. After two attempts on their lives, it's clear someone's after them-- but who...and why? One thing that I particularly enjoyed, although other readers might not, is the absence of some of the secondary characters. Don't get me wrong, Vera Van Alst, Signora Panetone, and Jordan's Kelly relatives are wonderful characters, but they can be overwhelming and have the tendency to elbow their way into the action. It was nice to see how Jordan can handle herself without her usual backup, and now that I've had a little break from curmudgeons, cooks who specialize in ambrosia, and crooks with hearts of gold, I'm raring to see them again. 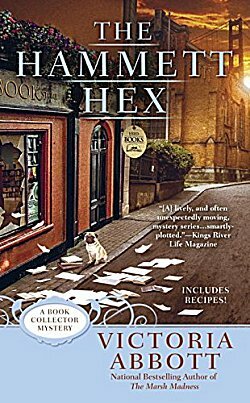 Quite simply, I love Victoria Abbott's Book Collector mysteries with a passion, and if the series ever ends, I will pout so hard that I'll trip over my lower lip. Haven't met Jordan and the gang? You have to do something about that, quick! Let's see...rare books, a hunt for a Hammett, and a San Francisco setting.. yep, this sounds like a great context for a story. Not surprised you enjoyed it so well, Cathy. This series started out as enjoyable and rapidly turned into something very special. Interesting summary. Don't know if it's my cup of tea. Is it a cozy? And what is the time period? Like it says at the very bottom, it is a cozy. It takes place in the present day. Just...plllllllllllease don't stop writing this series! I don't want to do my lip an injury!